A recent BBC show makes it clear why we really shouldn’t get physically aggressive with today’s computer systems! Please Don’t Let that Robot Rescue Me! 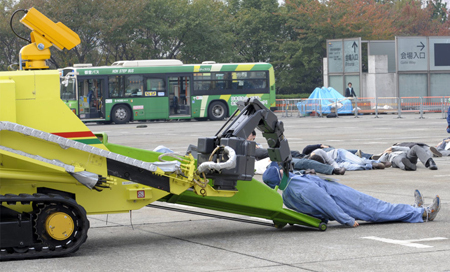 This rescue robot from the Tokyo Fire Department is performing a drill with a manikin. However, I don’t like the way that it is dragging the victim up the ramp by his neck. Good Lord! Please don’t let that robot rescue me!!! Mark Yim, associate professor member of the General Robotics, Automation, Sensing and Perception (GRASP) Lab at the University of Pennsylvania, introduces reassembling/reconfiguring robots. The robot below called Ckbot is constructed of 15 modules grouped into 3 clusters of 5 modules each. Each cluster is equipped with a camera (24 frames per second video), a blinker LED, and an accelerometer. The other modules have proximity sensors, servo motors, and a computer. When the system is disassembled, each cluster rights itself and seeks out the other clusters so that they may dock and reconstruct the robot. The University at Albany (SUNY) has highlighted Knuth’s research in a recent news piece. 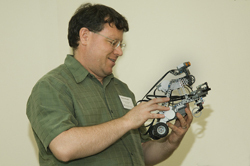 Kevin Knuth has a laboratory in the physics department of the University at Albany that is filled with LEGOs. The bricks are relatively cheap and can be used to rapidly prototype a robot’s body. Knuth’s robots are being programmed to solve such problems as mapping complex terrain. At UAlbany Day on Saturday, Oct. 25, he will give a demonstration on Robotics and Robotic Exploration in Life Sciences Room 143 at 10:45 a.m.
Visit Autonomous Exploration News for information on Knuth’s company Autonomous Exploration Inc.
An Israeli company Argo Medical Technologies has developed a human exoskeleton that can help people with lower limb paralysis to walk. The technology is called ReWalk and “enables wheelchair users with lower-limb disabilities to stand, walk, and even climb stairs.” It is a robotic suit that can be partially concealed by clothing. The users walk with crutches, and the suit senses changes in the center of mass and the limb position to detect and respond to user intentions. A Reuters article on the topic can be found here. European researchers are working on an EU-funded project called HISMAR (Hull Identification System for Marine Autonomous Robotics) to develop a robotic hull cleaning system to remove marine growth from ships. Marine growth significantly increases the friction of a ship moving through water, which significantly increases the cost in terms of energy. In addition, marine growth poses an environmental hazard. More information on the HISMAR project can be found here. More information can also be found in the article at ZDNet.